For several decades, the Barclays U.S. Aggregate Bond Index (known as the Lehman U.S. Aggregate Bond Index until November 2008) has been a central reference point for bond investors — a benchmark with widespread acceptance comparable to the S&P 500 or the Dow Jones Industrial Average in the equity world. The “Agg” comprises more than $17 trillion worth of bonds, based on current market value, and was designed to include the whole landscape of domestic, investment-grade fixed-income sectors, from U.S. Treasuries and agency issues to mortgage-backed and asset-backed securities. The Agg is the benchmark for multi-billion-dollar institutional funds as well as scores of mutual funds that seek to gain exposure to the broad spectrum of the U.S. fixed-income universe. Many funds are designed to substantially track the performance of the Agg, with the manager seeking to add alpha — or outperformance of the index by virtue of skill — by overweighting or underweighting its sectors. Some passive index funds seek to replicate its performance as precisely as possible. Between passive exchange-traded funds and index funds, actively managed mutual funds and institutional mandates, many trillions of dollars are invested in strategies pegged to this benchmark, and too often, this fact alone results in a significant misallocation of risk for investors. In “Thinking outside the index,” we explore how the Agg has come to represent a diminished set of risks for fixed-income investors — and, hence, a diminished set of opportunities. At present, we see more value — and more worthwhile forms of risk — in the $4 trillion worth of securities that lie outside the Agg, along with some sectors in the Agg that have not been targets of government intervention. The key here is that the sources of risk inherent in these sectors are far more diverse and much less contingent on declining interest rates to fuel returns. 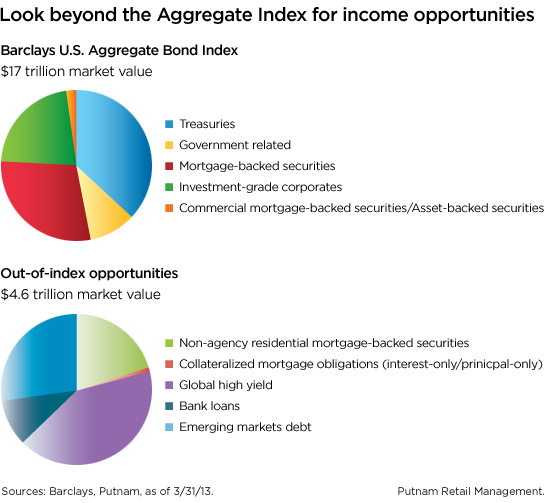 Putnam favors an approach to fixed-income investing that targets opportunities across the bond markets, both inside and outside broad indices like the Agg, while allocating assets toward those risks most likely to offer attractive returns. In today’s investment environment, with interest rates kept artificially low in a number of developed markets, we believe the potential returns associated with most term-structure risk within the constraints of the government-heavy Agg are not commensurate with their downside risks and opportunity costs.